A sobering reminder of what happens when your product doesn’t stand up to customers’ expectations: an attraction in Milton Keynes optimistically named ‘Winter Wonderland’ has been forced to shut down just two days in, after visitors bombarded its Facebook page with complaints. Less Santa’s grotto, more Santa’s grot. Oh. The Winter Wonderland MK website promised ‘attractions to surprise and delight your family, such as ice skating, live music, Santa’s grotto, a Christmas market and more’. In the event, though, the ice skating was described as ‘a few plastic sheets’ and Santa was played by ‘young, thin men’ ‘dressed in Santa outfits from Poundland’. ‘When we arrived we were told Santa wouldn’t be there until after 4pm,’ Lesley Keys, who had paid £65 for various attractions, told the BBC. 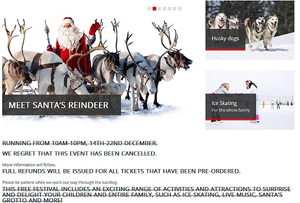 This isn’t the first time an event organiser has used festive cheer as an excuse to prise cash from reluctant parents’ hands: in 2010, ‘Lapland’ in the New Forest was dubbed ‘Crapland’ when visitors complained that the ice rink was broken. The nativity scene was a painted board in a muddy field and the huskies looked so miserable, someone called the RSPCA. On that occasion, the organisers were charged with (and almost jailed for – until a technicality overturned their conviction) misleading customers. Winter Wonderland MK organiser Lorenzo Franco, though, has tried to salvage his reputation during a series of red-faced media appearances. ‘I am very sorry to disappoint people. It was not my intention. It was meant to be a family fun event,’ he said miserably during an interview on BBC Look East. Christmas event organisers, beware: hell hath no fury like the parents of a toddler whose festive dreams have been ruined….